Last night I sampled everything from mushroom pizza to ravioli to tiramisu at a lively Italian tapas restaurant and wine bar. Then I came home and ate a couple cookies. This morning I woke up and showered. Then I went to the kitchen and ate a couple cookies. Tonight I indulged in a three course dinner that ended with an outstanding warm pineapple brioche pudding. Then I came home and ate a couple of cookies. My point? 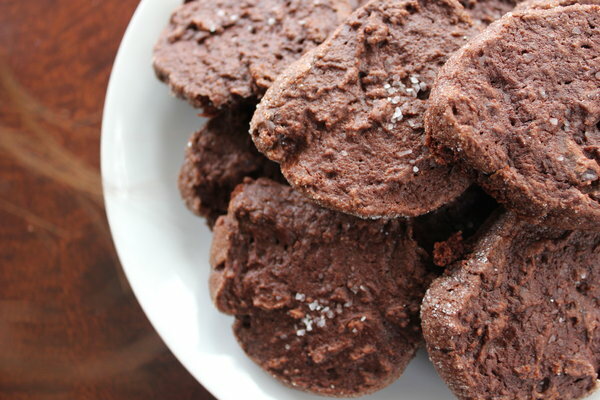 These Salted Chocolate Cookies are addicting. They melt in my mouth like fudge, but are not nearly as dense. 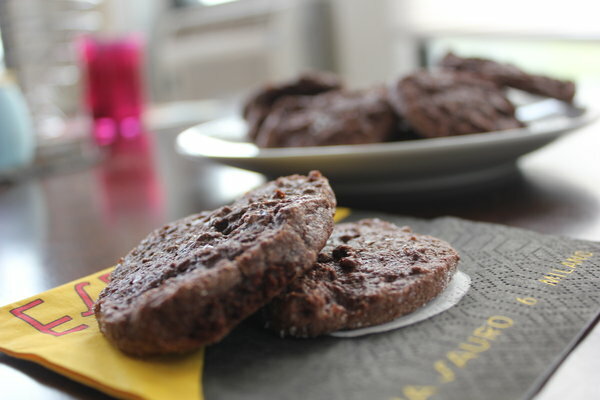 The rich chocolate flavor is brightened by a few flakes of salt that are sprinkled over the cookies before baking. I regret that I avoided making these cookies for months. Usually when I cook I like to prepare everything in one day. Spending all afternoon preparing a dish and then sticking it in the fridge for the next day seems anti-climatic. So when I found out that the dough in these Salted Chocolate Cookies had to be refrigerated overnight, I put the recipe on the back burner. While I used to think overnight refrigeration was a recipe deal breaker, I now appreciate having two more logs of chocolate dough sitting in my fridge, waiting for me to slice and bake. These delicious slice and bakes would be a perfect gift for friends and family and are fit to serve to guests for with breakfast, lunch, or dinner. Alex Milling is a recent graduate of Northwestern University and loves dry red wines. Fill saucepan with 2 inches of water and bring to simmer. Set aside 1/3 cup of chocolate. Put remaining chocolate in a double boiler over the saucepan. Heat chocolate, stirring until chocolate completely melts. Take off heat and seat aside to cool. In a separate bowl, whisk together flour, cocoa, and baking powder. Using a mixer, beat the butter on medium-high speed until creamy. Slowly add the sugar, and continue to beat until the mixture is smooth. Add the eggs one at a time, mixing well. Beat in the salt and the vanilla. Add the chocolate and beat until combined. Then add the milk and beat until combined. Add the flour mixture a little at a time and beat until just combined. Finally, add the left over 1/3 cup of coarse chocolate until just combined. Divide the dough into 3 portions. Put each portion on a large piece of plastic wrap, and shape into a log, using the wrap to help roll and smooth it. Twist the ends to seal. Chill overnight. When ready to bake the cookies, preheat the oven to 350°F, and line a baking sheet with parchment paper. Put parchment on cooking surface and line with 2-3 teaspoons of sugar. Roll one log in the sugar until evenly coated. using a knife, cut dough into 1/3 inch slices, lay on baking sheet, and sprinkle with roughly 10 flakes of kosher salt. Bake for 10 minutes; center will still be soft to touch. Let cool and enjoy! ADDICTING IS NOT A WORD!!! Try Addictive. Wow, what a nice comment the previous poster left for you (not). I am excited to try these!